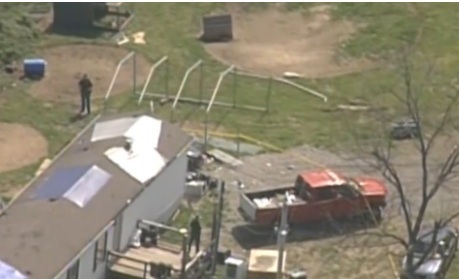 PIKE COUNTY, Ohio -- A law enforcement source has confirmed that investigators found some 200 marijuana plants in the executed Ohio family's indoor grow operation, CBS News senior investigative producer Pat Milton reports. The source said the size of operation indicates it was being grown for sale not for personal use. Each plant could produce about one pound of marijuana. A pound of high-grade quality marijuana has a street value of about $2,000. A second law enforcement source said that investigators are looking at numerous avenues as a motive for the killings among them is whether there is a Mexican drug cartel connection or a possible drug turf war or family feud. A Facebook threat mentioning one of the eight members of an Ohio family who were shot and killed execution-style on Friday is among the the evidence investigators are examining, CBS News has confirmed. The threat specifically called out Christopher Rhoden Jr., who died along with seven other members of the Rhoden family, in a string of shootings at four rural locations. "I'm aware of the Facebook threat," Ohio Attorney General Mike DeWine told CBS News. "Every piece of information is valuable and our investigators are certainly taking that into consideration." Pike County Sheriff Charles Reader, said most of the victims were targeted while they were sleeping. He said it was clear the family was targeted and that he has warned the surviving members of the Rhoden family to take precautions and arm themselves. "I cautioned them, told them we will be there," Reader told CBS News. "I told (them) to be armed." One member of the family, who asked not to be identified, said the relatives are "torn up" over the murders. "And you know what I mean, kinda freaked out because we don't know. There's still killers on the loose, or killer," he said. Authorities confirmed Sunday that marijuana grow operations were found near some of the sites where the Rhoden family members were murdered. The Friday killings at four different homes near Piketon, Ohio, was "a sophisticated operation," DeWine said at a news conference in the small community that has been on edge since the seven adults and one teenage boy were found shot in the head. DeWine cautioned it was too soon to determine if the marijuana grow operations and the murders were directly connected. At the Dogwood Festival in downtown Piketon on Sunday afternoon, the crowd was smaller than usual. Courtney Boyer came with her infant daughter. "People are scared to come out," she said. "What if that person who shot all those people is running around here. You don't know who it is. Or what they're capable of doing?" Authorities have been scrambling to determine who targeted the clan and why. Investigators have interviewed more than 30 people in hopes of finding leads in the deaths. The victims were identified Saturday as 40-year-old Christopher Rhoden Sr.; his 16-year-old son, Christopher Rhoden Jr.; 44-year-old Kenneth Rhoden; 38-year-old Gary Rhoden; 37-year-old Dana Rhoden; 20-year-old Clarence "Frankie" Rhoden; 20-year-old Hannah Gilley; and 19-year-old Hanna Rhoden. It appeared some of the family members were killed as they slept, including Hanna Rhoden, who was in bed with her newborn baby nearby, authorities said. The infant was 4- or 5-days old. The baby, Hannah Gilley's 6-month-old baby, and 1 other small child were not hurt. Since the slayings, authorities have refused to discuss many details of the crime, including any evidence or the search for the assailant or assailants. Investigators sought tips and gave people a number to call if they had any details about the crimes. A Cincinnati-area businessman also put up a $25,000 reward for information leading to the capture and conviction of the killer or killers. Two of the crime scenes are within walking distance of each other along a sparsely populated, winding road that leads into wooded hills from a rural highway. The third residence is more than a mile away, and the fourth home is on a different road, at least a 10-minute drive away, said the investigation's leader, Benjamin Suver, a special agent in charge with Bureau of Criminal Investigations. An out-of-breath caller who found two of the eight family members told a 911 dispatcher in a quavering voice that "there's blood all over the house." "I think my brother-in-law's dead," she said, her voice rising as she adds later that it looks like someone has "beat the crap out of them." "I think they're both dead," she said before breaking down into sobs, according to one of two 911 call recordings released Saturday by the state attorney general's office. Phil Fulton, the pastor of Union Hill Church up the road from where some of the victims were found, described the family as close-knit and hardworking. He said they were previously part of his congregation, though not recently. "We're just doing everything we can to reach out to the family to show them love and comfort," Fulton said. Kendra Jordan, 20, said she often worked nights at a nursing home with the mother of the newborn and described her as outgoing, funny and always smiling. "If you were having a bad day, she'd be the first one to come up to you to question you about what was going on," Jordan said. "She was amazing." Jordan said the town would have difficulty recovering from the loss of a such a well-known family in the tight-knit community. "Everyone knows that family, you can't not know that family," she said. "They're involved in everything, and they're at every event that's going on in town. Just about see them anywhere you went."